So sad for your loss, @pinkandyellow. I hope you have notified the police about the theft. I doubt they'll recover the electronics, but the backpack itself--with Fray in it--might turn up unharmed. What a shame! But hopefully if the thief just wanted electronics, your Fray will be found unharmed. I know how you feel, having something precious stolen from you & it's miserable. I appreciate everyone trying to console, but I really don't want to work up hope. It was a high crime area, the thief had to have a car to carry the heavier things they took, and she could be in any dumpster in Calumet City. If I let myself hope that I'll get her back, I think it'll be worse. I did report it, though, sent the police a picture, just in case. I am sorry for your loss. Will your car insurance cover the loss? I know it wouldn't be Fray, but perhaps in time another LTF could join her in your heart and make that hole smaller. I don't think so, but that's worth looking into. It wasn't my car (thankfully); I'll have to ask work people about the insurance we have. @pinkandyellow - If it was a work vehicle I would think it has to be insured, especially with multiple drivers. The company wouldn't want to be found liable in case of accident--and break-ins do happen, unfortunately. I would check with your own insurance also. OMG. So very sorry. Nothing can replace the love you've invested in her, but the others are right, the sheer cost involved...and don't forget the price of her faceup and whatever outfit she had on...company insurance really should cover. On the personal front...Wiishu and I are hoping to rejoin the ranks here. It's been awhile since we've been active. He wanted to drop in and say "hi" and I'd like to ask if anyone remembers a LF faceplate from probably 2014. It must have been a limited run because I just don't see it anymore. It had a wonderfully wicked little smile, elf ears and rather narrow eyes. I really want to do the Seiten Taisei version of Goku from Saiyuki/Saiyuki Reload and the sleeping FP would have modded perfectly. I had a request for it on the MP for a long time, but it's long gone now. Anyone remember this little fella? Welcome back @Vindalootoo ! I'm glad to see you and Wiishu again. Thank you! RL has really gotten in the way the last few years. I finally got around to taking some pictures of this girl - she definitely needs a new faceup, and probably a bath. But the pictures turned out okay anyways! New faceup is sure your choice, but that cute red wig certainly goes with the one she's got! Wow...I went to the link and zoomed in and didn't see anything. Did you photoshop them out? Funny how we "moms" and "dads" can spot things! @ohbumblebee Now that you've pointed them out I can kind of see the scuffs in the shot above, but they're really not too bad. She's just not quite ready for her close-ups! I always find that awkward point between when you start noticing a face-up's damage and when you finally have to give in and get a repaint to be so nerve wracking. 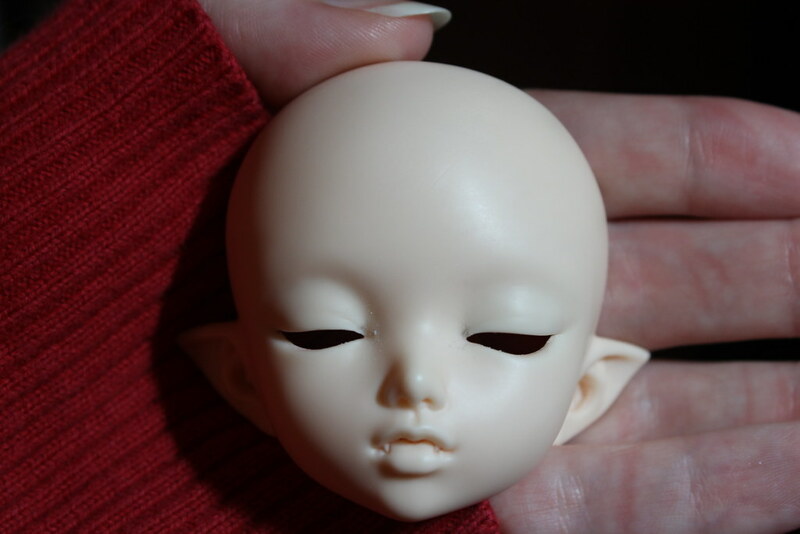 I hate trying to decide on a face-up artist, so I just drag that stage out way past any reasonable point. And just for some spam, here's an old pic of my girl right before I finally bit the bullet and sent her off. I think sometimes we become just a little obsessed with perfection in this hobby. It's kinda like the faceup police are hiding around the corner ready to point fingers. I kind of like the occasional evidence of active lovin'. Goodness knows Wiishu, not to mention Pooki, show plenty of signs of their adventures. That being said, I was noticing while processing my latest photostory, that the time to work on Pook's face has come. His little pukisha nose is disappearing! EDIT: whoops, didn't notice how old your post was, I saw you found what you were looking for in the Customizing forum just now, so never mind, good luck with your mods^^! A lot of my hesitance is also just the time it takes. I’m so impatient >.<. And I do like her default face up. But sometime soon she will be sent off!